Bontrager released a revamp of their most popular road tire lineup today. The all-new R3 Hard-Case Lite improves on the best-loved parts of the original and delivers more speed, a significantly longer tread life, and better protection against punctures. To create the new R3 Hard-Case Lite, Bontrager’s engineering team developed an all-new proprietary rubber compound called TR-Speed, which rolls faster and increases the life of the tire. R3 Hard-Case Lite now also features a light tread for more traction and confidence in corners and a sleek modern look. Lightly treaded, the dimples increase grip. Bontrager went back to the drawing board for the new R3 and totally reworked the rubber compound to deliver a tire that rolls faster on the road and in the lab. TR-Speed offers a 75% increase in tread life for performance that lasts. Bontrager also improved the new R3 Hard-Case Lite’s puncture protection by adding a supple breaker belt made from tightly woven Nylon105. The result is a lighter tire with better road feel and a 12% increase in protection against punctures. The new R3’s lightly treaded casing adds traction and confidence in corners. As the tire size increases, the traction becomes more pronounced, which is perfect for aligning size with the tire’s intended use. 700×23 tires are smooth and light, 700×25 tires have a lightly recessed tread, and 700×28 tires get external tread which is more pronounced on 700×32 tires. 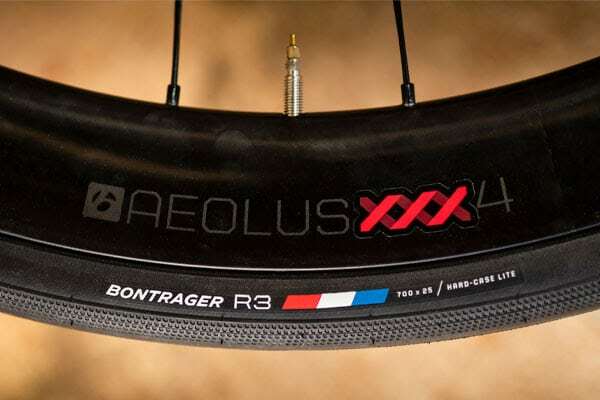 Like all Bontrager products, new R3 tires are backed by the Unconditional Bontrager Guarantee, which gives riders 30 days to love their purchase. If they don’t, we’ll take it back. It’s that simple. New Bontrager R3 Hard-Case Lite tires are available in three models: R3 Hard-Case Lite ($54.99 MSRP), R3 Hard-Case Lite TLR ($64.99 MSRP), and R3 Hard-Case Lite Reflective ($59.99 MSRP). R3 tire models come in 700×23, 700×25, or 700×28, with reflective options for 700×25 and 700×28. R3 Hard-Case Lite TLR also has a wider 700×32 option with either black or brown sidewalls. Bontrager’s new R3 Hard-Case Lite tires are available exclusively online at trekbikes.com and through Trek’s global network of retailers.